KUALA TERENGGANU: A large part of the 200-year-old Ho Ann Kiong Chinese temple in the Chinatown here has been destroyed in a fire. The temple was built in 1801 by the early Hokkien community. It is among the oldest structure in the state. Almost 60% of the building was destroyed in the 9.30pm fire on Monday night. No fatalities were reported. State Fire and Rescue Department officer Mohamed Amin Mohamad Basir said preliminary investigations showed there were no elements of arson or sabotage involved. Three fire engines with 15 firemen managed to put out the fire in about 25 minutes. Those living near the temple first saw smoke billowing out from the building at 9.30pm but could not do much as the gate was locked, said state MCA chairman and Bandar state assemblyman Toh Chin Yaw. Great loss: Bystanders preventing caretaker C.K. 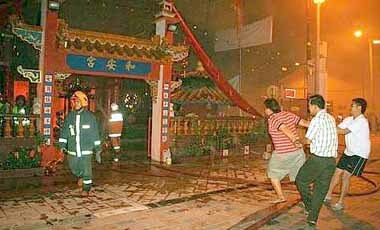 Tan, 24, from rushing into the burning temple in Kuala Terengganu on Monday night. Tan wanted to dash in to salvage the statue of the Goddess of the Sea or Ma Zu. Rebuilding the temple would be a difficult endeavour as building materials were shipped in from China about 200 years ago, he added. Kuala Terengganu MP Mohd Abdul Wahid Endut said he would contribute towards the temple restoration as it was part of the state’s heritage. State Police Chief Senior Asst Comm 1 Datuk Mohd Shukri Dahlan said police would not compromise on any attempt by anyone to relate the fire to arson or attack on places of worship.